Space, as of recent I feel like utilizing more and more. The challenge is the physical space around my work won’t always be the same. I’ll only have so much control over what I can and can’t do. Today – lines want to move out into a bit of space. 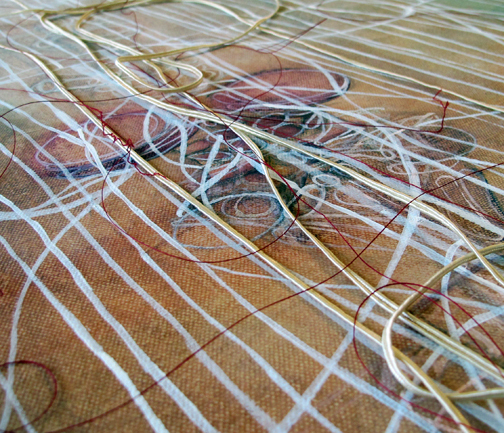 I spend the day drawing lines and laying out string. I enjoy it, it’s quieting. 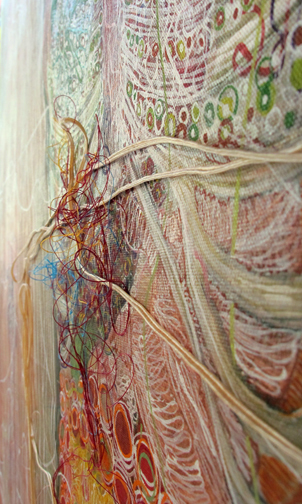 I think about fibrous tissue, and energetic line – two different things. I’m not the first person to want to take a line off a surface, nor am I the first artist who wants to control space – maybe on some level we all want that. I don’t know. It’s all just a thought now. Let’s see how things plays out. I never liked this first set of 2 cats that I painted. I thought them too sweet. Yesterday I was talking to a friend about polarities, after that conversation I knew exactly what I wanted to do to these small compositions that I was struggling with. It’s the same cat on the front and on the back, taking up the same area on the paper. Maybe I call it Two Sides to Every Story. As of now, this first one is my favorite. It’s organic. It came to be, out of uncertainty. The cat itself is somewhat modeled after ROA’s work. I set up the skeleton in egg tempera and the cat in graphite, underneath is casein muscle structure. The background came about while I was trying to obliterate it. I guess I let go of the self-imposed set up, the idea of one side in pure casein and one side in pure egg tempera wasn’t working. I got another set of designs (below) and reworked them too. The graphite took so well to the prepared paper, how could I not use it. I brought in hard and soft pencils, an eraser, sand paper, a scratching tool, and gesso. And I mixed the casein and egg yolk. The cat above and the rat below, are pure and painterly egg temperas. 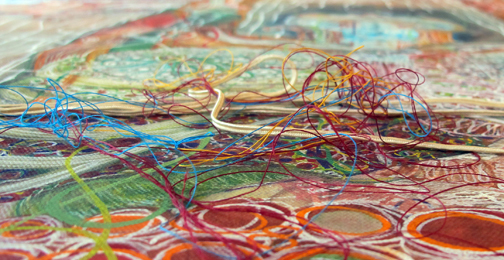 But their other sides – mixed-media. I began all this the first week of May after Carolyn brought me a sheet of prepared paper. The first 2 images in this post are that sheet, it’s the lightest in weight and the most flexible and was the most precious. I was going to paint cats – for the fun of it. Obviously I enjoyed the surface of the paper, and all the mediums. I pulled out all my longer and softer paintbrushes. I painted. 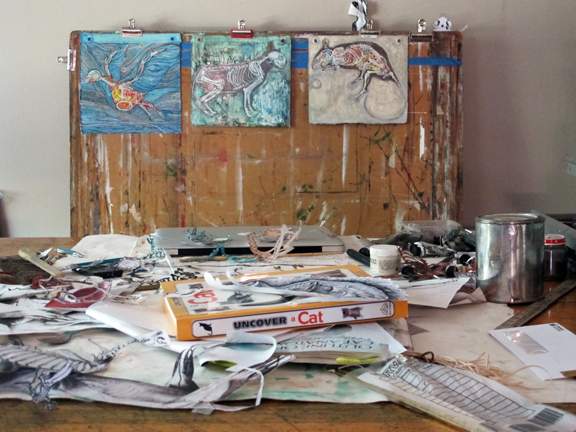 3 sheets of prepared paper – 1 bird, 4 cats and 1 rodent later, my studio is a mess. It’s too hot to have egg yolk lying around, it smells. I’m done for now with the experimenting, drawing a day or a week, thing. Time to pause, look – and reorganize. 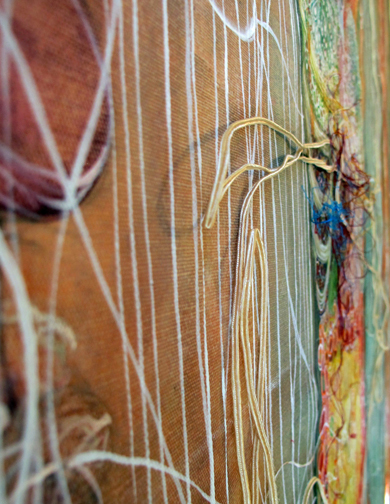 Somebody asked me about egg tempera this week…always happy to talk about my materials. You only need three ingredients to make the paint. * Want to know how to separate the egg yolk from the egg white? Click here and watch my exciting play-by-play video. Its sure to have you on the edge of your seat. It’s all just an idea;thought takes on form, and becomes experience. Interaction follows. It’s what art making is all about. About this photo she explains, I am spraying symbols that I have made from Carolyn’s (Lavender)garden. Graphic designers use clip art or vector graphics to make symbols, mapmakers use them a lot. I cut up scans of my drawings and photos to make symbols. I can have hand drawn imagery in my digital pieces, it makes them more like drawings for me and puts the drawing in a new , less precious format. WHO: CAROLYN LAVENDER, MARY SHINDELL, MONICA AISSA MARTINEZ, and one more other.